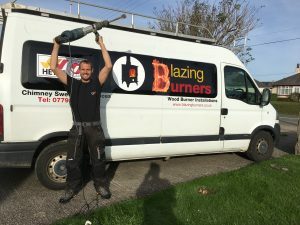 Welcome to Blazing Burners – we are a HETAS registered wood-burner installation company based in Perranporth, Cornwall. Small, friendly, & professional – we’re proud of our great customer service & quality installations, delivered at competitive prices. We’re a small company. 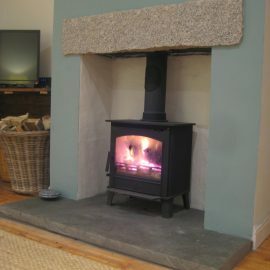 Yet our portfolio boasts hundreds of stove installations covering both domestic and commercial sectors throughout Cornwall, Devon and other areas of the country. We have experience in working alongside many different building companies and have installed in a wide variety of properties and spaces: houses, caravans, shepherd huts, campsites, pubs, bars, restaurants, hotels and workshops! We’ll ensure you get a professional, personal & friendly service at the right price. We have all areas of an installation covered: advice, stoves, full fireplace renovations, flue liner and twin wall flue installations. Just tell us what you want and we’ll make it happen. 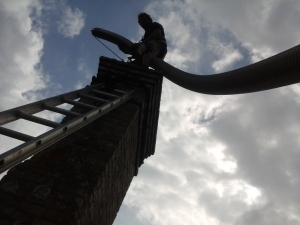 Where we can, we’ll install a flexible flue liner inside your existing chimney. If this is not possible, we will install a new flue system that will either run inside or on the outside of the property. Sweeping flues, servicing stoves and fitting cowls are all part of our remit too. Our HETAS registered installations will ensure your stove and flue will be safe and effective. Excessive public liability coverage is in place for your peace of mind. You should expect excellent customer & aftersales service, high standards, and quality workmanship. 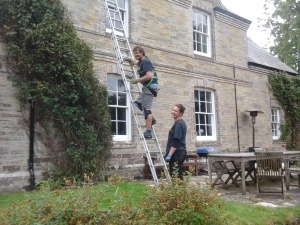 Your property will be respected throughout the works and left clean and tidy on completion. From your initial enquiry, any questions you have will be answered clearly. The installation process is controlled by stringent building regulations so we’ll find out what you want, what is possible, and give you the information you need in order that you get what you want. To get the ball rolling, an estimate can be given over the phone or email, and then followed up with a free survey at your property. The survey will involve more questions, measurements and a thorough inspection. We have years of experience so we know what potential hazards lay ahead and how to overcome them in order that your installation runs as smooth as possible. We aim to have sent your official estimate of costs to you, within a few working days of the survey. If you want to arrange a free survey, click here. We believe in using the best materials and techniques. After all, we are dealing with fire! We use Duraflue for our flexible flue liner and twin wall flue systems. We use Midtherm for our vitreous enamel stove pipe. We believe these flue systems are the best available. They are extremely well made, perform well, look great and are practical to install with. They might cost slightly more than other cheap liners and flue systems, but they’re worth it. We won’t compromise on quality. If you want to provide your own flue, you’ll likely have to look elsewhere to get it installed. Sorry! We don’t have a showroom. This means that we are not biased toward any manufacturer. It also means that we have installed a wide variety of stoves. We’ll be able to give you several stove choices rather than just a few. Of course we also have our favourites, and we’re happy to share these with you, providing they tick your relevant flue box! We can even install stoves that you have supplied – providing that they are fit for your purpose and meets the industries standards. Depending on your budget and your specific installation needs, we’ll guide you to the right stove for your own needs. 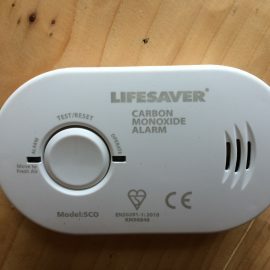 You should be aware that we will endeavour to get you a stove that is efficient and clean burning – likely an Ecodesign Ready stove – as these stoves are the best available for reducing air pollution. If you purchase a stove from us, you’ll likely receive a discount – either on the installation or the stove. You’ll also have the peace of mind that if anything goes wrong with the stove, you won’t incur potentially costly remedial fees. Upon completion of your installation, your stove and flue will be tested and commissioned. You will be shown how to use your stove and your installation will be registered with HETAS. This means that you will receive a certificate of compliance and you should be confident that building regulations have guided your installation. If you have had a sweep or stove service, your certificate will detail any advisories and recommendations for continued use. 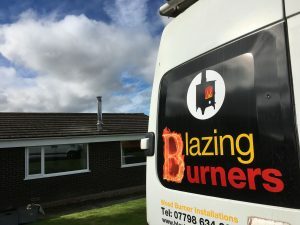 If you are considering an efficient, economical and green way to heat your home, at a competitive price and with a great service, make certain it’s a Blazing Burner. Contact us now to see if you can have a stove installed.